Size: Up to 15 inches or so. Growth Form: Shrub; clumping, stem (flattened) pads sprawling to ascending or erect, stem segments blue- to yellow-green, sometimes tinged maroon-purple. 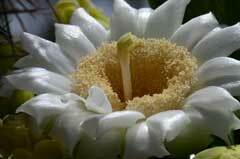 Leaves: Spines lacking or few; glochids numerous, yellow to red-brown or dark brown. Flower Color: Pink to magenta throughout, rarely white; filaments red-magenta (purple); anthers yellowish, style white to pink; fruit spine-less except var. treleasei; seeds yellowish to tan. Flowering Season: * February to June (* variable per variety). Elevation: Up to 3,000 or * 5,500 feet (* depending on variety). Habitat Preferences: Variable depending on variety; slopes, desert flats, hills sandy to rocky soils; woodlands, Mojave an Great Basin deserts; oak-pine woodlands. 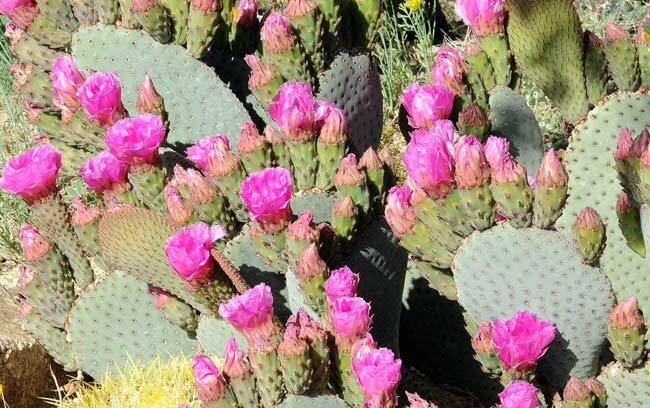 Recorded Range: In the United States Opuntia basilaris is found in AZ, CA, NV, UT. It is also found in northern Mexico. In Arizona it is found generally in western parts of the state. North America & US County Distribution Map for Opuntia basilaris. Threatened/Endangered Information: Arizona: Opuntia basilaris is salvage restricted; Opuntia basilaris var treleasei is a species of conservation concern and in the Center for Plant Conservation's National Collection of Endangered Plants; Opuntia basilaris var longiareolata is a species of conservation concern. 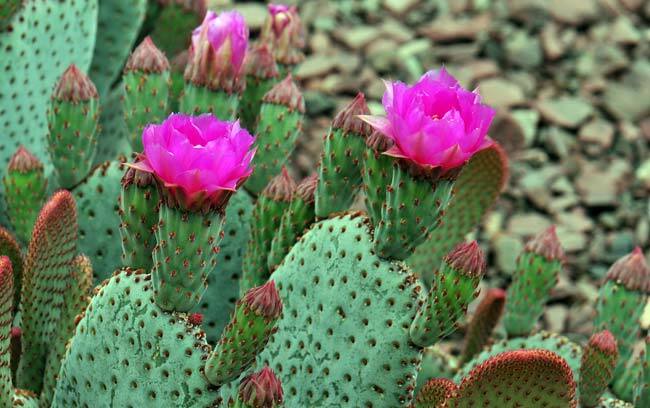 Genus Information: In North America there are 52 species for Opuntia. Worldwide, The Plant List includes 194 accepted species names and a further 203 scientific names of infraspecific rank for the genus. 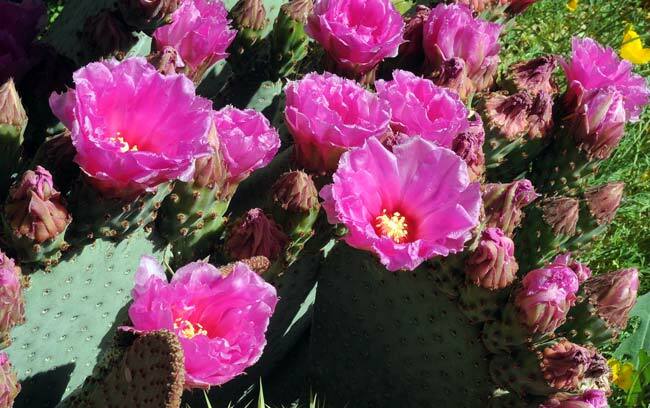 In the Southwestern United States: Arizona has 16 species of Opuntia, California and Utah each have 10 species, Nevada has 6 species, New Mexico has 13 species, Texas has 23 species. All data is approximate and subject to taxonomic changes. Opuntia basilaris var. treleasei, Trelease's Beavertail Pricklypear (CA). Comments: There are 4 varieties of Beavertail Pricklypear and their flower blooming dates, habitats and preferred elevations are extremely variable. In Southwest Desert Flora also see: Cactus Apple, Opuntia engelmannii; Long-spined Prickly Pear, Opuntia macrocentra; Twistspine Pricklypear, Opuntia macrorhiza; Tulip Pricklypear, Opuntia phaeacantha and Santa Rita Pricklypear, Opuntia santa-rita. Ethnobotany Ethno-Herbalist: Southern California Ethnobotany; Ethnobotany of Southern California Native Plants: Beavertail Pricklypear, Opuntia basilaris. Beavertail Pricklypear has been used for food by southwestern United States indigenous peoples. Cahuilla Food, Dried Food; Buds cooked and dried for indefinite storage. Cahuilla Food, Porridge; Seeds ground into mush. Cahuilla Food, Unspecified; Buds cooked and eaten. Cahuilla Food, Vegetable; Joints boiled and mixed with other foods or eaten as greens. Diegueno Food, Dried Food; Fruit cleaned of thorns, dried and eaten. Diegueno Other, Cash Crop; Fruit dried and sold by children in small sacks for ten cents. Kawaiisu Food, Unspecified; Buds cooked and eaten. Tubatulabal Food, Unspecified; Species used for food. See complete listing of ethno-botanical uses at Native American Ethnobotany, University of Michigan, Dearborn. U.S. Dept. of Agriculture, Natural Resources Conservation Service on-line database and USGS ITIS search (accessed 07/30/2017). The Plant List (2013). Version 1.1. Published on the Internet; http://www.theplantlist.org/ (accessed 07/30/2017). Donald J. PinkavaFNA FNA | Family List | FNA Vol. 4 | Cactaceae | Opuntia 29. Opuntia basilaris Engelmann & J. M. Bigelow, Proc. Amer. Acad. Arts. 3: 298. 1856.; Flora of North America Editorial Committee, eds. 1993+. Flora of North America North of Mexico. 16+ vols. New York and Oxford. Native Plant Information Network, NPIN (2013). Published on the Internet http://www.wildflower.org/plants/ [accessed: 07/30/2017]. Lady Bird Johnson Wildflower Center at The University of Texas, Austin, TX. Donald J. Pinkava Vascular Plants of Arizona: Cactaceae Part Six: Opuntia - JANAS 35(2): 137-150. 2003.
http://ucjeps.berkeley.edu/eflora/eflora_display.php?tid=35202, accessed on July 30, 2017. SEINet for synonyms, scientific names and recorded geographic locations, (accessed 07/30/2017).